These Sweet and Tangy Slow Cooker Cranberry Meatballs are a fun and tasty protein-packed appetizer! Made with frozen meatballs, this dump and cook recipe is as easy (and delicious) as it gets! 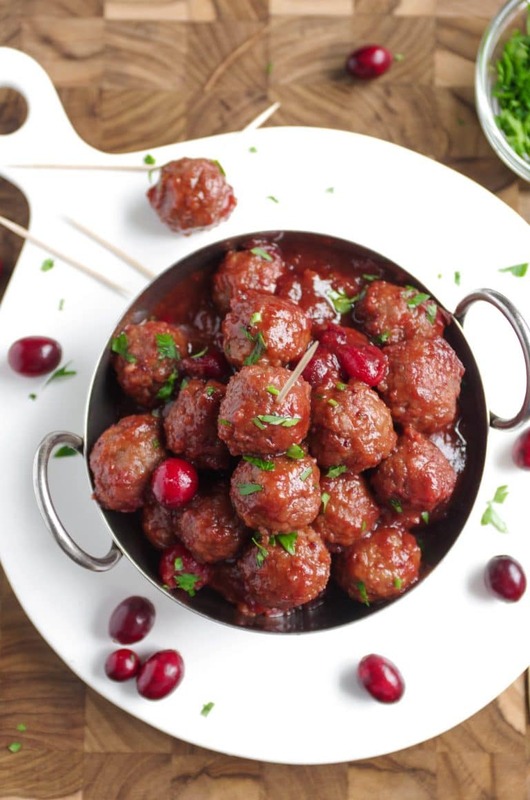 You guys are going to love this cranberry meatball recipe! Made entirely in your Slow Cooker, these delicious little meatballs are sweet, tart, and completely addictive. One bite is never enough! 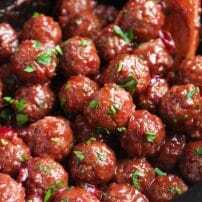 Since making these cranberry meatballs two years ago, I have since prepared them for Thanksgiving, Christmas, and New Year’s and they are always a huge hit. Not a fan of parties? That’s ok. You can also enjoy these meatballs for an easy lunch or dinner with cauliflower rice, spaghetti squash, or a big bowl of roasted vegetables. 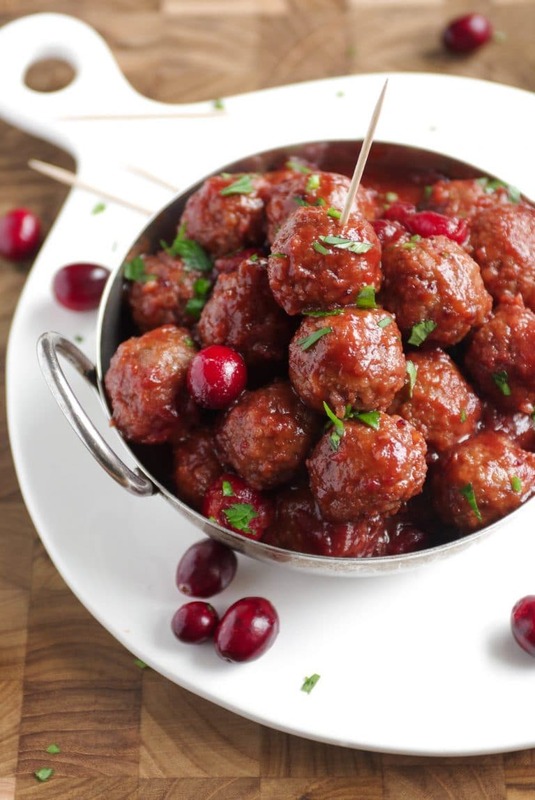 Making cranberry meatballs at home is incredibly easy! Just a handful of simple ingredients and tossing together and you’ve got yourself some sweet, tangy, and slightly spicy meatballs. The hardest part is waiting for them to cook! Make the sauce. In a medium mixing bowl whisk together the cranberry sauce, hoisin sauce, ketchup, red wine vinegar, soy sauce, brown sugar, hot sauce, minced garlic, ground ginger, and cayenne (if using). Technically, you can do this inside the pot of your slow cooker. 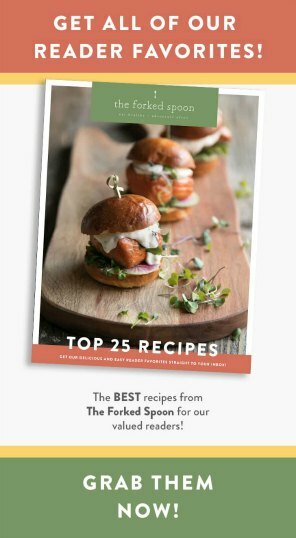 Just make sure that if you do so, you mix everything together with a rubber spatula or whisk. Mix until fully combined and add fresh cranberries. Set aside. Add everything to the slow cooker. Add the frozen meatballs to the bowl of a 6-7 quart slow cooker. Pour in the cranberry sauce and stir well to combine. Cook. Turn on the slow cooker and cook on high for 2 hours or on low for 3-4 hours, or until the sauce is bubbly and the meatballs are heated through. Keep warm and serve. 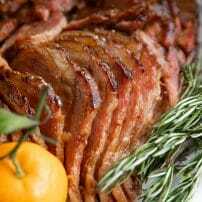 Once fully cooked, place your slow cooker on the warm setting until ready to serve. Serve garnished with fresh chopped parsley, if desired. In this particular cranberry meatball recipe, I used the mini party size meatballs from Trader Joe’s. 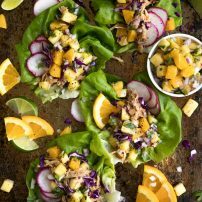 These little guys are perfect for this recipe and just the right size for parties. 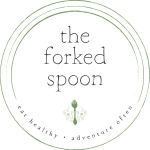 They cook perfectly right from frozen and taste delicious. If you don’t have a Trader Joe’s near you…move. Just kidding! You can use whatever frozen meatball brand you prefer. Ideally, look for mini or “party size” meatballs as they are easiest to eat in parties or gatherings. Can you use homemade mini meatballs? absolutely! I do recommend, however, that you bake or pan-fry them prior to adding them to your slow cooker. This will guarantee that the meatballs don’t form into one large mass while cooking. When I made these originally, I made them to take along with me to a holiday party. Sweet, savory, somewhat spicy- everyone loved them. 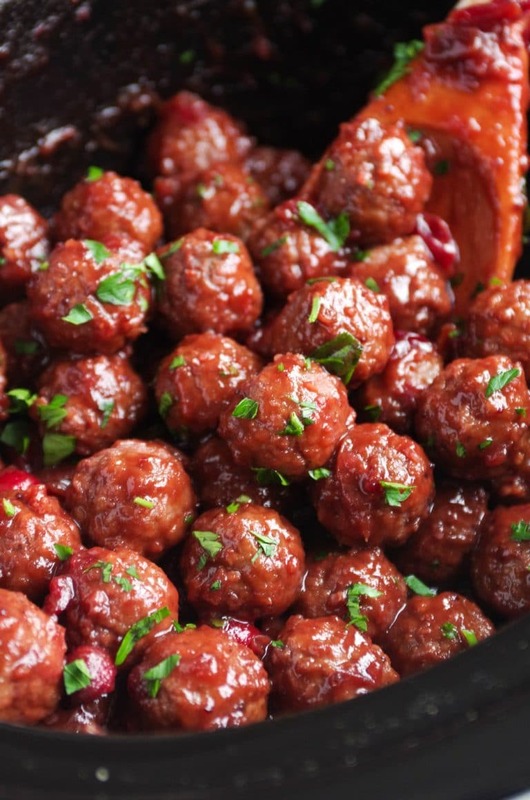 These cranberry meatballs really are fantastic eaten one-by-one. Other delicious ways to enjoy these meatballs? With rice. Regular rice or cauliflower rice, you really can’t go wrong when you combine sweet meatballs with rice. Meal prep. Guys, these are so GOOD leftover. 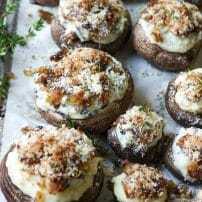 Meal prep these bad boys and enjoy them for lunch the next day. Pop them on pizza. Here’s the thing- cheese plus sweet cranberry meatballs PLUS carbs is basically a dream. Or, be healthy and eat them with a bunch of healthy veggies like this butternut squash, Brussels sprouts, or sweet potatoes. If you try cooking these sweet and savory meatballs, please leave me a comment and let me know! I always love to hear your thoughts. DON’T FORGET TO PIN AND SHARE THESE SLOW COOKER CRANBERRY MEATBALLS TO MAKE FOR AN EASY AND FLAVORFUL DINNER OR HOLIDAY SIDE DISH THE WHOLE FAMILY WILL LOVE. 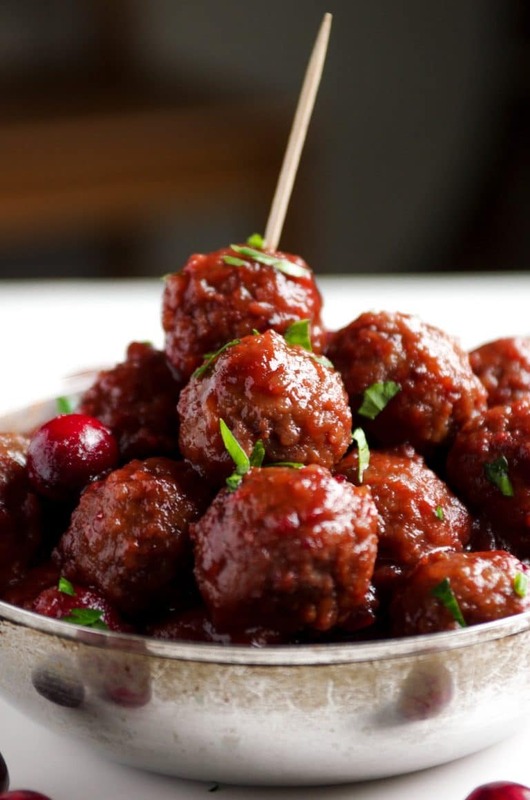 Sweet and Tangy Slow Cooker Cranberry Meatballs are a fun and tasty protein-packed appetizer! Made with frozen meatballs, this dump and cook recipe is as easy (and delicious) as it gets! Make the sauce. In a medium mixing bowl whisk together the cranberry sauce, hoisin sauce, ketchup, red wine vinegar, soy sauce, brown sugar, hot sauce, minced garlic, ground ginger, and cayenne (if using). Mix until fully combined and add fresh cranberries. Set aside. Pro tip- make your own cranberry sauce! It's super easy and tastes like a million bucks. I served these at our Christmas brunch. They were delicious, but too spicy for most of our clan. I wish I’d seen the note at the bottom of the post sooner, but it’s my own fault for not tasting as I went. 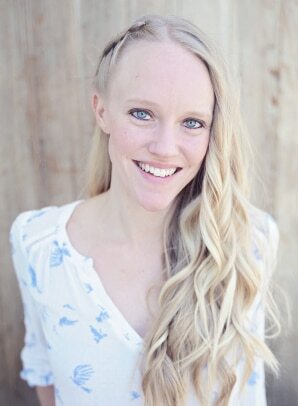 Thanks, Jessica! These look good enough to eat them by themselves! I have to try this really soon ,thank you!